Do you feel that by the end of winter your body becomes heavy? During Christmas and winter farewell parties we tend to eat too much, but we must admit that while it is dark and cold outside, one of the most available sources of joy for us is food. By the time spring sets in, even a healthy body signals that it is full and exhausted. The signs of this may be tiredness and dejection. What can be done if we know that the problem is something other than vitamin deficiency? It is most probable that our body is crying out for detoxification. We may support our body’s own “purifying” processes if we pay attention to our diet, eat less food high in fat and sugar, while at the same time consume more fruit and vegetables, or resume an exercise routine. In CaliVita®’s range of products there are several success formulas which support the detoxification and refreshment of our body. We have no doubts about the effects of Liquid Chlorophyll, which is one of our customer’s longtime favorites. Chlorophyll extracted from alfalfa helps eliminate toxic substances while the valuable active ingredients of alfalfa – amino acids, vitamins K, B as well as minerals – vitalize our body, help refill the vitamin and mineral stores of our body and maintain its level too. 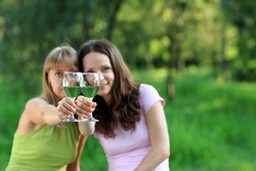 In popular medicine chlorophyll is considered to be an effective internal “deodorant”. In other words, it has deodorizing effects which is definitely an advantage when toxic substances leave our body. Its pleasant mint flavoring is the result of us having added natural mint oil to it. Did you know that our customers also consume Liquid Chlorophyll to alleviate the unpleasant symptoms of excessive gastric acid production? When the fibers of ground prickly pear cactus in the tablet Nopalin come into contact with liquid, they swell, creating a feeling of satiety, so this formula may be of great help to those going on a slimming diet. In addition to reducing appetite, fibers have a beneficial effect on digestion and make stools easier to pass, which is of paramount importance in detoxification. Moreover, it has a favorable effect on blood lipid levels as according to several studies which have shown that consumption of nopal cactus fibers reduced LDL cholesterol levels, while not affecting HDL, so called ‘good’ cholesterol levels. It had a similar beneficial effect on blood sugar levels in the case of type II diabetes. In the course of the examination, they applied it before a glucose load test, and they measured a significantly lower blood sugar elevation. It may be useful not only for diabetic patients, but for those going on a slimming diet, and those suffering from insulin resistance which frequently results in PCOS ,a polycystic ovary disease, accompanied by irregular bleeding and infertility. Prepare your body to be able to accept vitamins and minerals,and welcome spring with a purifying course. Among the products offered by CaliVita®, you can easily find a formula which may help the natural detoxifying functions of your body, so make use of this opportunity. Chlorophyll has not yet been tested on pregnant and breastfeeding mothers so during pregnancy and breastfeeding it is strongly advised to seek medical advice before use. When ingesting it orally, chlorophyll may dye urine and tools greenish, and may cause discoloration of the tongue as well. Nopalin should always be taken with abundant amounts of liquid in order to enable the swellingof its fibers and the development of satiety. Aguilar, C., Ramirez, C., Castededa-Andrade, I., Frati-Munari, A.C., Medina, R., Mulrow, C., Pugh, J. Opuntia (prickly pear cactus) and metabolic control among patients with diabetes mellitus Annu Meet Int Soc Technol Assess Health Care, 1996, 12:14.